HAPPY NEW YEAR! I hope that I can come up with a few great recipes and cook some delicious and healthy food this year. Oh, I also would love to try a lot of new recipes. 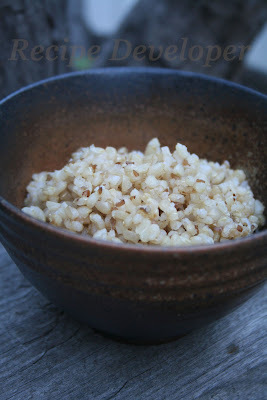 When I cooked brown rice the other day, I remembered that I had some buckwheat and added it to the brown rice. Cooking brown rice needs more soaking time than white rice does, so I usually soak in over night, or soak in warm to hot water before I cook it. This time I soaked the buckwheat in hot water about one hour and added two(2) table spoons of buckwheat per 1 GO ( Japanese measurement unit = about 180cc = 6 ounces) and started cooking. It comes out really nice, I even thought that I can add more Buckwheat. Both, the brown rice and Buckwheat texture mixed very good and the colors blended nicely together. When I cooked white rice with Buckwheat Tea (SOBA-CHA) before, there was that typical SOBA-CYA flavor I could smell, but this time the aroma was very subtle and mild. I believe that it is because SOBA-CHA was roasted and that made the rice have a more strong flavor. This rice would be perfect for OCHA-ZUKE Rice!